Speaking to about 100 troops at the Camp Swift base, Perry thanked the Guard members — some of the more than 2,200 who have volunteered to take part in the operation — and said people around the country in recent weeks have told him they are grateful for the surge. Texas Republicans have largely supported the deployment, saying it is needed because the federal government is not fulfilling its duty to secure the border. But many Democrats and other critics have questioned the operation's funding and its necessity, saying it is either foolish or political to send troops to a humanitarian crisis that has largely entailed unaccompanied children crossing the border. Perry emphasized that the troops’ primary goal is deterrence, assisting Department of Public Safety forces who are taking border crossers into custody. Due to what he called the federal government’s abdication of responsibility, he said that aside from the unaccompanied children, drug smugglers and traffickers have seeped through a porous border, “spreading their tentacles of crime and fear” throughout the United States. The bulk of the troops are still in training, though Perry and Guard officials refused to provide specifics on numbers, timeframe and tactics, saying they did not want criminals to have that information. Guard officials said a small contingent of National Guard troops is already at the border as part of a separate, pre-existing operation tasked and funded by the federal government. In response to reporters’ questions, Perry said Texas has petitioned Washington to do more and to reimburse the state for its efforts. That included asking the Federal Aviation Administration for permission to use drones for surveillance efforts along the border — to no avail, Perry said. 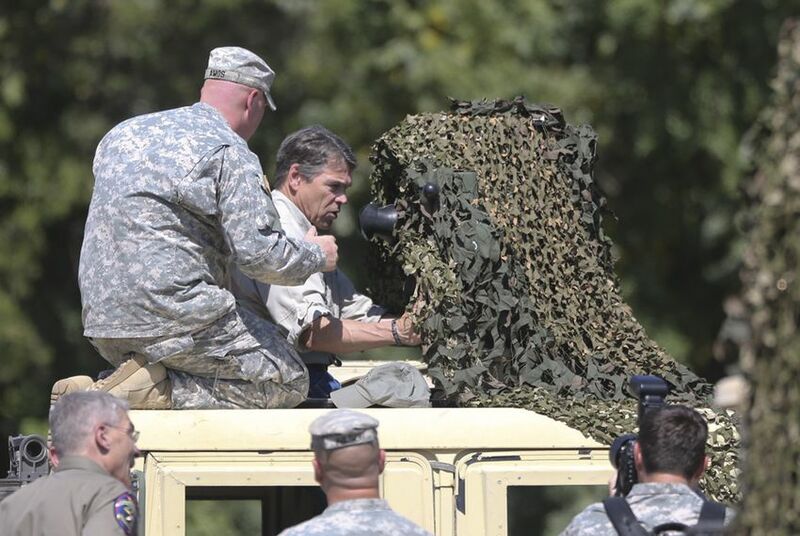 Afterward, Perry visited a firing range to take a look at the specialized equipment the Guard is using in enhanced optics training — green machines mounted on the backs of trucks, covered to look like foliage, that troops will use for observation. The decision to send 1,000 Texas National Guard troops to the border has garnered national attention and sparked some controversy since Perry announced it last month. Critics argue that the move is a political stunt by Perry, who they say is looking to bolster his conservative credentials before a potential second presidential run. Those critics say the money should have gone to supporting DPS forces already on the border. Perry quickly dismissed such notions on Wednesday. The state has funded DPS with an additional $1.3 million per week for Texas ranger reconnaissance teams over the past five weeks, leading to what Perry said was a 56 percent reduction in apprehensions in the targeted areas. The governor’s methods of funding the National Guard deployment have also drawn recent scrutiny, prompting discussion at a Legislative Budget Board meeting last week and a Senate Finance Committee hearing on Tuesday. The governor tapped $38 million in unspent DPS funds and transferred the money to the National Guard using an obscure budget rider — which invited some consternation from legislators who felt they should have been involved in the decision. Perry said on Wednesday that he understood legislators’ desire for transparency but that the state needed to support and fund the Guard and respect the troops’ sacrifices. It also remains unsettled how the deployment will be funded after this initial influx of cash runs out. With monthly National Guard and DPS costs totaling around $17 million to $18 million, this first round of funds is expected to dry up by October. Perry said that the state’s deployment of troops, and its funding of Operation Strong Safety, is intended simply as “a stop-gap measure” until the federal government steps in. DPS Director Steve McCraw also briefly addressed the troops, saying he looked forward to working with the Guard to prevent criminals from entering the state. “We can make the cartels’ lives miserable,” he said.